Today was a good day! I set off early in the morning to accompany my friend as she looked at some property out of town. She picked me up at 7 am and asked me if I was ready for an adventure! ALWAYS!!! I am always open to an adventure! I was bundled up because it was so cold and windy.We turned off the road and drove down a 1/4 mile driveway nestled in pines. We arrived at a large clearing and parked. We got out and proceeded to freeze (well I did). It did not stop us though from wandering. What a charming place! We left the beautiful woods and headed to a nearby town for lunch. We parked in front of an antique shop that my friend said we just had to go into. So we did. It did not disappoint! While examining an antique hutch I opened a drawer and it was full of vintage and antique lace AND the price was right! We will be going back there for sure! I scooped up several of the rolls of cotton lace and brought them home with me. They will be perfect for making some more angels! We had a lovely lunch at a little French pastry shop. I got a spinach/carmelized onion crepe with a light layer of goat cheese. It was delicious! After lunch we did a little shopping and I picked up some natural and white twine and 3 large rolls of kraft wrapping paper. When I got home, a package had arrived for me in the mail. 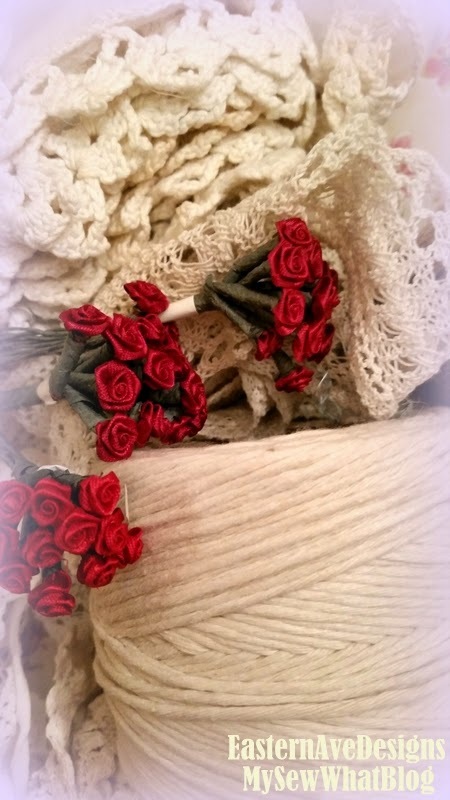 I had ordered some little tiny vintage flowers from an ETSY shop called Ribbonsales. 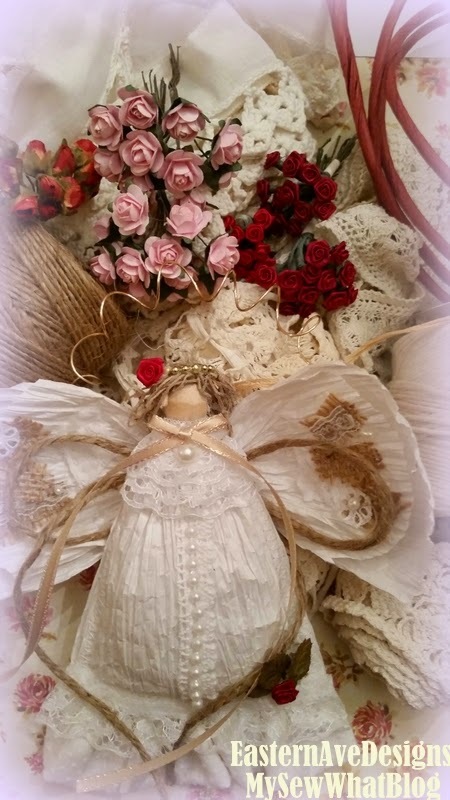 A friend had given me a small stash of these little flowers and I loved how they looked on my angel ornaments. 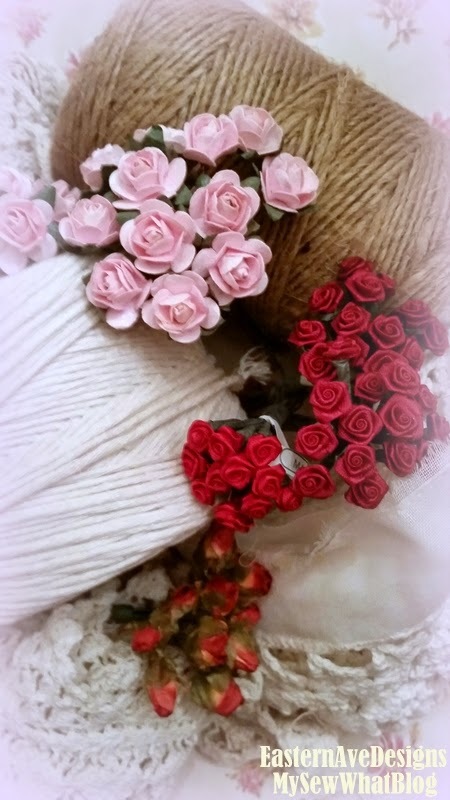 I did a search on ETSY and found some more of the burgundy roses and some additional pink roses that are a little bit larger but made from paper. They are so sweet! I asked a couple of questions prior to making my purchase and Ribbonsales responded to me within minutes of each question. She then set aside a special listing for me and once shipped that same day, they arrived very quickly. 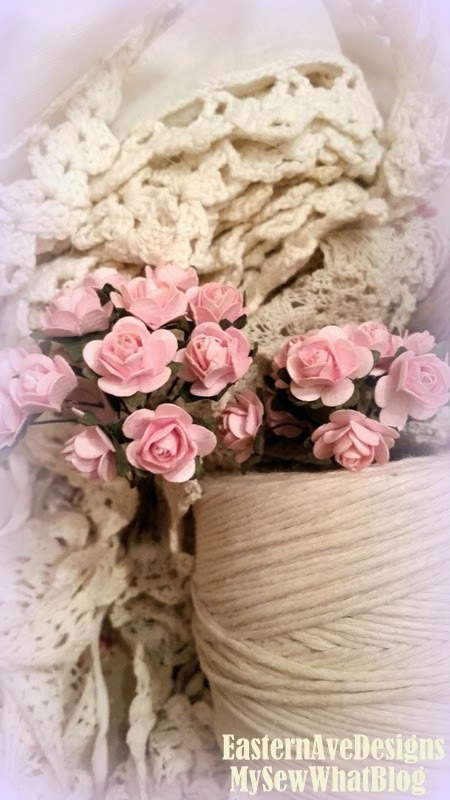 It was a good day--.a day spent with a friend, a little shopping, lunch, some good conversation, laughter--embellished with lace, flowers and twine! Simple pleasures!